NHK president Momii Kasuto at the microphone, Diet Budget Committee session, 20 February 2014. Image courtesy; Shugiin TV. Ask me no more questions. I’ll tell you no more lies. It has been an angry morning in the Diet Budget Committee. NHK president Momii Katsuto has been called to the microphone time and time again (Does the chair really have to say "Nippon hoso kyokai" every time, when just saying "NHK" would save three to five seconds?). Momii was asked time and time again to grapple with simple logic. Time and time again, logic came out looking the worse for wear. The head of NHK management Hamada Kei'ichiro had perhaps the winning entry in the contorted thinking category. He offered an argument that, if taken to its logical conclusion, would say that Momii cannot testify about what he said at a meeting of the NHK governors because he has not confirmed with himself the accuracy of his personal recollection of his own remarks. 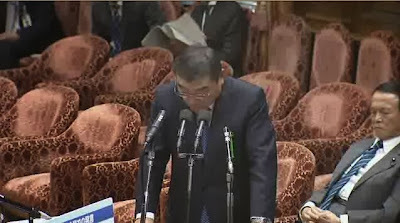 The complete insanity of the NHK representatives's non-testimony and Budget Committee chair Nikai Toshihiro's unwillingness to threaten Momii and Hamada with contempt led to five interrurptions of the session, with DPJ deputies barking and Nikai ordering the sound feed from the committee cut off. Momii, an Abe Administration albatross (Link) has proven himself useful in at least one way. After his performance this morning almost anyone else standing behind a Diet microphone, no matter how stubborn or prickly, will seem by comparison a model of cooperation and clarity. Later - Broken link in above now repaired.